Ditto in right maxillary sinus cavity. 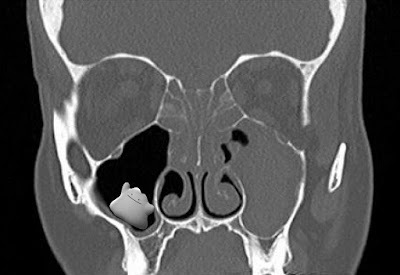 A well-respected ENT surgeon in Warrenton, VA created an uproar in the medical community when it was discovered that he failed to detect a rare sinus pathology on a CT sinus scan. This parasitic growth was easily discovered by the patient's teenage son within seconds of looking at the CT scan in spite of still being in high school. It's called a "Ditto" claimed John Smith, 14, son of the patient who suffered from this missed pathology. "It is one of the most rare Pokemon Go creatures and would have done much to allow my mom and I to achieve Pokedex together" said John. "Who would have imagined that this most rare of rare creatures would be found in little old Warrenton, let alone in my mom's sinus cavity!" "I can't believe the ENT Dr. Chang missed it!!! I mean, it's right there!!!" cried John Smith with obvious disbelief. The patient reported that in Dr. Chang's defense, her sinus pain and pressure was not over the right cheek region where Ditto was seen on the CT scan, but stated "That's no excuse." In his defense, Dr. Chang stated that "I thought the radiologist meant ditto as in 'similar or repeated thing'." "How was I supposed to know that he [radiologist] meant 'Ditto' and not ditto," Dr. Chang said with sadness. "If I had only known he meant 'Ditto', I would have also performed endoscopic sinus surgery on not just the left side, but also the right maxillary sinus cavity where Ditto was seen... I would have been actually able to capture Ditto in a specimen cup... a medical first!" But alas, on repeat CT Sinus scan, it was no longer there much to everybody's dismay. Given this verifiable documentation, it is now thought that Pokemon Go creatures may be the source of human pathology that previously have been filed away as medical mysteries. Indeed, Pokemon Go creatures may be a more common germ than even staph and strep. With graciousness, the patient allowed the CT sinus scan to be reproduced for others to see if they can find what Dr. Chang initially missed. Please note, in case you haven't figured it out yet, this blog post is a work of satire.